We have no sooner completed the harvesting of the last seasons crops when we have to start the physical and financial planning for the basket of summer crops to be planted in the 2015 to 2016 summer production season. One of the highest cost centres in crop production gross margin analysis is the budget and financing for fertilisation. I hope as farmers you were fortunate enough to have had a reasonable crop despite the very difficult season just past. Whether you had good or poor yields the question will arise as to the planning of an optimum fertilisation taking into account the physical and financial restraints experienced on your farm. A good place to start is an evaluation of your soil’s potential and current fertility status. Why do we take soil samples? Knowing the nutrient makeup of your soils, as well as the soil depth and the potential for realising various crop yields within the climate prevailing on your farm, will enable you as a farmer to make an accurate assessment of what fertilisation programme is required. Taking soil samples and sending them to a reliable test laboratory will need to give you, as a minimum standard, the parts per million results for the major elemental nutrients found being nitrogen (N), phosphorus (P) and potassium and the secondary nutrients sulphur, calcium, and magnesium. The test should also show the acidity of the soil (ph), clay content and the ratios of calcium (Ca) and magnesium (Mn). Minor nutrients include iron, manganese, copper, zinc, boron, molybdenum and chlorine. As a rule in South Africa, zinc, molybdenum and boron are usually added in the fertiliser mix or seed dressing as a precaution against any deficiency in the soil leading to poor plant growth. This information is used by you as a farmer together with your agronomist and fertiliser representative to plot a detailed plan for the fertilisation of the various crops to be planted. These may include maize, sunflowers, soybeans, sorghum and groundnuts. The cost of the fertilisation programme can then be accurately worked out and included in the budget. 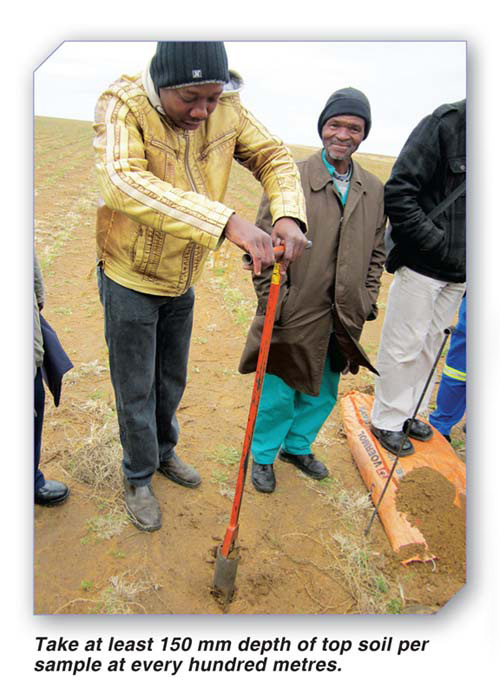 The yield results of certain level of nutrients in the fertiliser programme together with the known available nutrients are well proven for most soils and areas in South Africa. It is also essential to know the current status of your soil after a bad year, where very little of the fertiliser in the previous plantings were removed and after a good year where additional phosphates and other nutrients might need to be increased to ensure optimum yields and a profitable financial return. If you are taking over a new farm or land, soil samples should be taken as soon as possible after or during July and sent to the laboratories before the end of August. Laboratories are inundated with soil samples being received from all over the country from August to October so be prepared and do it early. Soil samples can be taken right at the end of a season as well. It also makes sense to combine the soil sample gathering operation while having a look at 1 meter by 1 metre and by 1 metre in depth soil profile holes that can be used to examine soil type effective root depth and the presence of any hard pan that might have developed in any of the lands to be planted. The correct cultivation techniques can then be used to break the hard pan before the coming season. Lands to be tested should be identified as to soil depth and soil type. A minimum of one sample for every ten hectares is the acceptable rule of thumb. Each section should be walked in a zigzag pattern with the soil sampler by using one of several kinds of soil augurs on the market to take at least 150 mm depth of top soil per sample at every hundred metres. Each mini-sample is then combined and well mixed in a clean bucket and a representative sample is in turn taken from the bucket and placed in the commercial standard plastic lined cardboard boxes which are available from the various laboratories. The boxes must be well labelled to show the farm and each land very clearly. It is really worth it to do a few lands properly so that accurate results can be obtained for the expense involved in fertilisation per hectare as it is a considerable cost these days and needs to be right. The most accurate results can be obtained by sending the samples to a lab within 24 hours. How regularly do we need to take soil samples? If a base line evaluation of the fertility of your own farm has been established for every land then at a minimum lands can be tested in rotation every three years. In the instance of double cropping in high yielding irrigation production so many nutrients are removed an annual test would be recommended. It is also advisable after very good or bad years to take soil tests so that the fertiliser plan can be optimised for the coming season. Take the extra time and trouble to know your soil fertility status. Don’t guess!